T-RackS 5 has evolved into the most powerful mix and master modular system ever, offering maximum processing versatility, an improved audio engine, four new processors for a total of 38 high-quality modules on a flexible 16 processor series/parallel chain, a comprehensive broadcast ready professional metering tool section, a new completely redesigned, smart single-window GUI as well as an album assembly section with multi-format exporting function. T-RackS 5 boasts more versatility and firepower than any of its competitors and gives you everything you need to professionally treat and finalize your audio from raw mixes to a perfect finished product ready for uploading to the leading digital delivery and streaming services or for CD printing. Not only have all the plug-ins been redesigned and adapted to take advantage of the full processing power of the new audio engine and the new sleek, zoomable GUI, but IK Multimedia has also created four new incredible processors that you will love. In T-RackS 5 now you have up to 38 incredible modules to choose from to build your perfect studio setup. T-RackS 5 Master Match module is a new type of plug-in that automatically matches the sound of your songs using up to three different source tracks as reference. Master Match calculates the spectral balance and perceived loudness of the reference tracks, analyzes them using sophisticated algorithms and then creates an exact match for the source material providing an editable ultra-high quality EQ curve and level adjustment. This can be achieved using the Master Match as a stand-alone processor or at the end of a pre-existing processing chain. The new T-RackS 5 Dyna-Mu vari-mu compressor/limiter is based on an iconic American coveted piece of hardware praised for its subtle but instantly recognizable sonic fingerprint. Thanks to its transformers and all-tube modeled heart, it can impart an audible magic which makes a mix bloom, amazingly gluing all the parts together. The Dyna-Mu is an exceptional all-rounder that will work wonders on full mixes as well as single sources. The new T-RackS 5 EQual digital equalizer is a 10-band, ultra-clear, high-end parametric equalizer with an extremely transparent sound, a full-screen resizable interface for ultra-precise editing and a vast array of filter shapes that replicate the typical curves of classic analog EQ’s from Neve, SSL, API and other legendary machines. This “hybrid monster” gives you the best of both worlds: digital precision and on-demand analog character. Plus, when it is zoomed full screen it allows for ultra-precise editing and fine adjustment without distractions from other elements on the screen, in a way that simply can’t be experienced with other digital equalizers. With T-RackS 5, you have the freedom to optimize your workflow as you please with 3 working environments that will suit every need. The stand-alone suite makes T-RackS 5 a complete, self-contained, one-stop mixing and mastering workstation that allows you to load a set of audio tracks and perform several operations, a typical method of top mastering studios. It's all in there: from an ever-expanding series of great sounding processors, to the most basic, but always necessary, waveform editing functions (like fades and length trimming of the audio file). Add to this a set of astoundingly precise and smooth, easy on the eye industry standard professional meters and you have everything you need to finalize your work from A to Z in one place. The plug-in suite allows you to tap onto almost all the standalone mode features within the environment of your DAW of choice as the most powerful channel strip or mastering chain available today as a plug-in. All T-RackS processors (including metering) can also be used as single plug-ins in any compatible DAW for multi-track mixing and stereo mastering duties. From equalizers and compressors, to reverbs, delays, harmonics enhancers and stereo processors, the choice is yours. T-RackS lets you get the job done faster and better than anything else. The all-new interface is designed so you can achieve everything from a single window, smoother and faster than ever. Plus, it’s fully resizable at will, meaning that you can exploit the full size of your screen when working with it. Just like in the previous T-RackS versions, the main module view shows the currently selected module, always sitting on top of the main frame so that its controls are quickly accessible. Just click on the module and tweak its parameters. The new flexible module chain view allows you to manage all the modules in a flexible way, dragging and dropping them into the 16-processor series/parallel signal chain at will directly from the sidebar carousel showing all T-RackS available modules. Simply put, no other platform allows such unprecedented versatility. 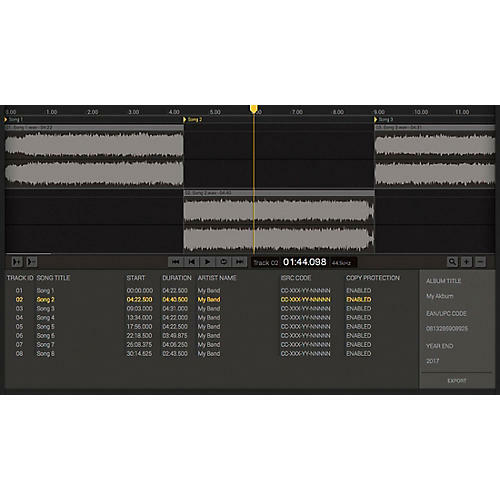 The waveform view allows for super-fast editing operations of the waveform such as trimming, fading and looping of a selected area as well as placing snapshots for settings recall. T-RackS 5 is more sonically powerful than ever. Now projects are supported with audio up to 192kHz / 32 bit floating point, so you can master for high-definition music platforms and distribution without ever leaving its single interface. Plus, there is also 4 dithering options added for you to choose from, meaning you can optimize the dithering noise when reducing the bit-depth of your tracks to match the actual content of the song. On top of that, T-RackS internal resampling engine has also been improved to deliver nothing less than best-in-class performance including DDM (Digital Delivery Mastering) on the way out from the final limiting stage, offering an additional layer of protection against inter-sample peaks and overshoots that could be generated by MP3, AAC encoding or similar compression and decompression processes. T-RackS 5 includes a comprehensive suite of metering tools – with a completely overhauled internal engine - that provides you with immediate and complete visual information about the content of your audio material, so you can easily achieve professional results that will meet the strictest broadcast compatibility standards and will always sound great. The new precision loudness LUFS meter, compliant with all leading professional reference standards, gives you valuable information about the integrated, mid or short term loudness of the material you are working on, so you know right away you are producing a master that has the perfect loudness for music delivery or broadcasting. Peak, RMS and Dynamic Range meters give you useful information about the “crest factor” and dynamic response of your mixes. This way you can decide whether you want to go for a more compressed sound or a more dynamic one while still retaining the emotional impact of your songs. In T-RackS 5 you now can sequence and assemble your full-length production directly within the interface and create a cohesive album sequence, with suitable track metadata, like pauses, fades, track ID’s, ISRC codes, CD-Text, etc. Then you can export single high quality master audio files or the whole project in various formats such as WAV, AIF, standard DDP image for professional replication plants, or Wav Cue files. It’s fast, it’s intuitive, and most importantly, it brings back the fun of sequencing an album that, despite being considered by many as a tedious activity, is indeed a true art form and one of the most emotional aspects of creating a full music experience. IK Multimedia warrants to the original purchaser of the computer software product, for a period of ninety (90) days following the date of original purchase, that under normal use, the software program and the user documentation are free from defects that will materially interfere with the operation of the program as described in the enclosed user documentation. To make a warranty claim under the above limited warranty, please return the product to the point of purchase, accompanied by proof of purchase, your name, your return address and a statement of the defect, or send the CD(s) to us at the below address within ninety (90) days of purchase. Include a copy of the dated purchase receipt, your name, your return address and a statement of the defect. IK Multimedia or its authorized dealer will use reasonable commercial efforts to repair or replace the product and return it to you (postage prepaid) or issue to you a credit equal to the purchase price, at its option. IK Multimedia warrants only that the program will perform as described in the user documentation. No other advertising, description or representation, whether made by a IK Multimedia dealer, distributor, agent or employee, shall be binding upon IK Multimedia or shall change the terms of this warranty. EXCEPT AS STATED ABOVE, IK MULTIMEDIA MAKES NO OTHER WARRANTY, EXPRESSED OR IMPLIED, REGARDING THIS PRODUCT. IK MULTIMEDIA DISCLAIMS ANY WARRANTY THAT THE SOFTWARE IS FIT FOR A PARTICULAR PURPOSE, AND ANY IMPLIED WARRANTY OF MERCHANTABILITY SHALL BE LIMITED TO A NINETY (90) DAY DURATION OF THIS LIMITED EXPRESS WARRANTY AND IS OTHERWISE EXPRESSLY AND SPECIFICALLY DISCLAIMED. IK MULTIMEDIA SHALL NOT BE LIABLE FOR SPECIAL, INCIDENTAL, CONSEQUENTIAL OR OTHER DAMAGES, EVEN IF IK MULTIMEDIA IS ADVISED OF OR AWARE OF THE POSSIBILITY OF SUCH DAMAGES. THIS MEANS THAT IK MULTIMEDIA PRODUCTION SRL SHALL NOT BE RESPONSIBLE OR LIABLE FOR THE LOSS OF PROFITS OR REVENUES, OR FOR DAMAGES OR COSTS AS A RESULT OF LOSS OF TIME, DATA OR USE OF THE SOFTWARE, OR FROM ANY OTHER CAUSE EXCEPT THE ACTUAL COST OF THE PRODUCT. IN NO EVENT SHALL IK MULTIMEDIA LIABILITY EXCEED THE PURCHASE PRICE OF THIS PRODUCT.